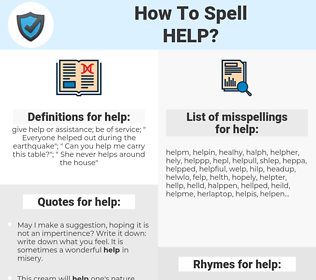 What are the misspellings for help? What are the common mistypes for help? What is the definition of help? What does the abbreviation help mean? What are the quotes for help? What are the rhymes for help? What are the translations for help? 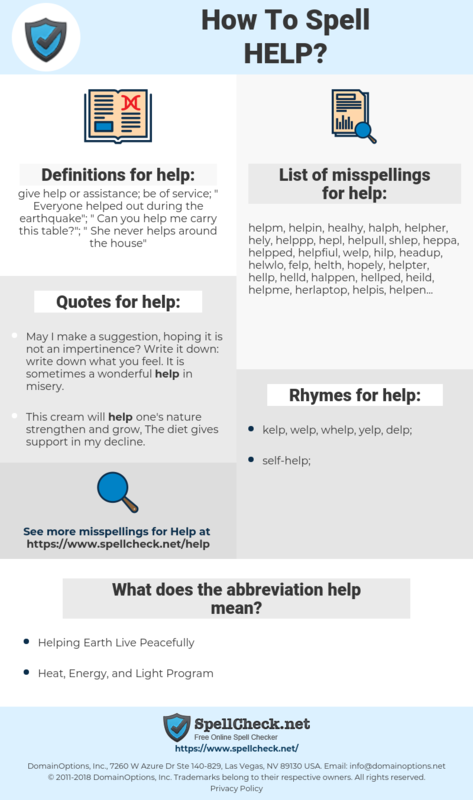 What are the common typos for help? This graph shows how "help" have occurred between 1800 and 2008 in a corpus of English books. 有助, 协助, 扶, 助益, 壁助, 救命！. ondersteunen, bijstaan, helpen, assisteren, hulp verlenen. soutenir, outil, favoriser, secours, aider, moyen, assistance, appui, appuyer, aide, servir, soutien, assister, accompagner, contribuer, faciliter, coup de main, à l’aide !. Hilfe, Beistand, Zutun, helfen, mitwirken, dienen, Handreichung, Hilfskraft, Mithilfe, Hilfeleistung, mithelfen, Auxiliar, verhelfen, weiterhelfen, nachhelfen, Hilfefunktion, Aushilfe, Hilfe!. assistenza, contributo, aiutare, aiuto, sostenere, assistere, favorire, ausilio, soccorso, bantù, aiuto!. 助ける, お手伝い, 手伝う, 応援, 一助, 力添え, 助, 世話, 手を差し伸べる, 扶助, 救ける, 扶ける, 援ける, てをさしのべる, いちじょ, おせわ, 御陰, ほさ, おたおた, 御手伝い, 佐ける, たすく, せわ, ごうりき, ほじょ, 手つだう, おうえん, 輔佐, おてつだい, 合力, ちからぞえ, ごうりょく, かいじょ, 助けて！. apoiar, ajuda, auxílio, ajudar, socorrer, apoio, socorro!. favorecer, evitar, socorro, ayuda, asistir, asistencia, apoyo, ayudar, remediar, beneficiar, valer, concurso, ¡socorro!.